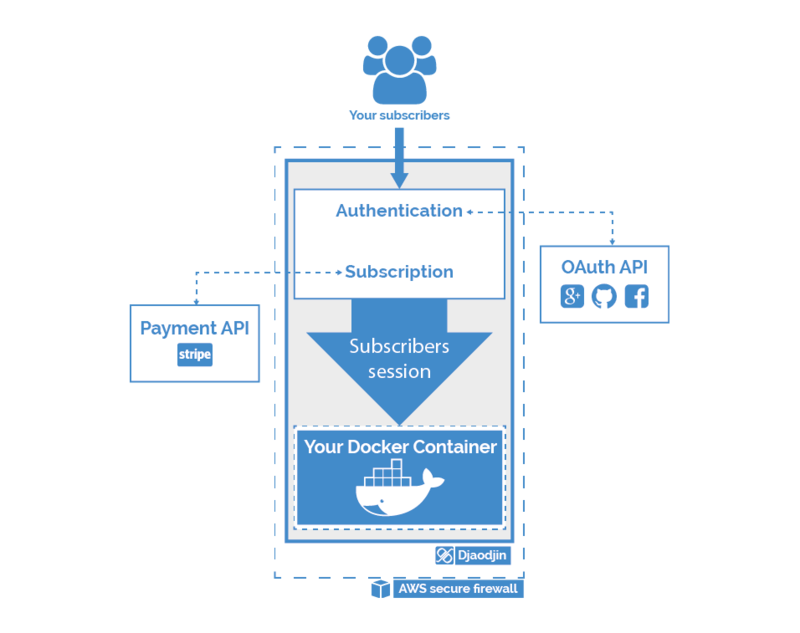 There are no third-party keys to manage in the mobile or web front-end, there are no esoteric CORS configuration to setup... From your User Interface (UI) team, all calls to the djaoapp API looks exactly like a call to your business logic API. 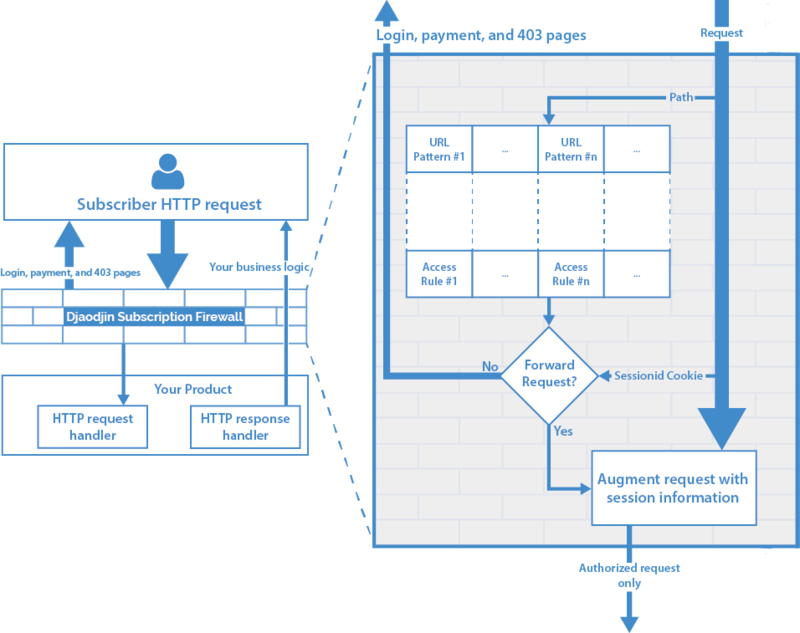 Let's see a high-level view of the HTTP request pipeline and why the microservice approach is the way to build modern SaaS products, then dive into how to integrate djaoapp with your business logic backend. Let's assume you have a SaaS product that helps users manage their todo list. Djaoapp immediately adds 3 ways for users to authenticate with your SaaS product and all the appropriate pages for users to manage their credentials. Let's assume you decided to authenticate a user named Xia through a POST request to /api/auth/. At this point, your backend business logic has nothing to do. Everything is handled by djaoapp and a valid token is returned to the browser. Now your front-end user interface (UI) is doing a GET request to the backend server passing the authentication token along, to retrieve the user profile information (ex. GET /api/users/xia/). Again, your backend business logic has nothing to do. Djaoapp checks that the authenticated user (i.e. xia) has permissions to access the profile information and returns it. checks the authenticated user has permissions to make that request (see defining access rules). Once your backend server receives the djaoapp forwarded request, it will decode the session data with its DjaoDjin secret key (see Frameworks integration) and process the request according to your business logic. When your hosting your business logic as a Docker container on djaodjin.com, all HTTP requests fall through djaoapp first before reaching your application. The need for encryption and signature is somewhat less. None-the-less it is good practice. In case you are hosting your application yourself on the open Internet and rely on djaoapp as a reverse proxy, you will need to fully aware of the trade-off between using encrypted cookies and JSON Web Tokens. Djaoapp is able to decorate HTTP requests it forwards to your application using two protocols. You can set which one is used in the Rules dashboard under Web application. You also have the ability to test the headers generated under the Testing section. Using the JWT-based session backend in the Rules dashboard, djaoapp decorates the forwarded HTTP request with a Authorization header that contains Bearer and a JSON Web Token signed with your DjaoDjin secret key. We provide libraries that make it straightforward to integrate the djaoapp session manager in front of many popular frameworks. 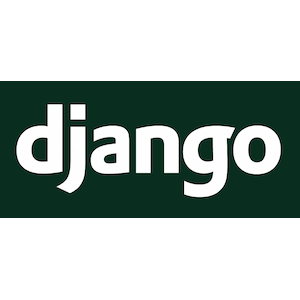 + DJAODJIN_SECRET_KEY = "Your secret key"
deployutils.apps.django.mixins.AccessiblesMixin to test if a user has a specific role on an organization. Djaoapp then replaces the sessionid Cookie with the encrypted JSON session information and forwards the request to your server. Your server decrypts the sessionid Cookie, then retrieves the information necessary to build a response from the JSON encoded session. The full Python source code for the decrypt function is available as open source. Assuming you are a lazy hacker, you can even execute openssl through a shell command (though we will deny having suggested the idea). We also provide libraries that make it straightforward to integrate the djaoapp session manager in front of many popular frameworks.